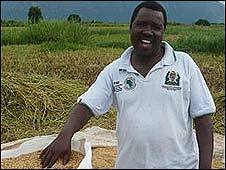 BBC NEWS | Africa | Can Tanzania reap bumper harvests? Can Tanzania reap bumper harvests? To the untrained eye, the never-ending green of the maize, rice and sugar cane fields of northern Tanzania look lush and bountiful. It is rice harvest time, and under the shadow of Mount Kilimanjaro the roads are jammed with tractors and bicycles stacked with bags of rice destined for market. Perhaps the perfect setting for Africa's "green revolution", a concept being pushed by former United Nations head Kofi Annan and his successor Ban Ki-Moon, for the continent to better feed itself. But these small-scale farmers around the city of Arusha are beset by problems. "I have three acres of paddy and this year I harvested 25 bags from each acre," says Lucas Chacha, a rice farmer from the village of Magugu. "I sold each back for 35,000 Tanzanian shillings ($30; £15). Compared to the running costs it is not a fair price. "I had to sell because I had some family problems and I needed the money. "When you harvest you find the price on the black market and you sell because we have no permanent market where we can sell the rice." Mr Chacha's problems are typical not just of small-scale farmers in Tanzania, but all over Africa. 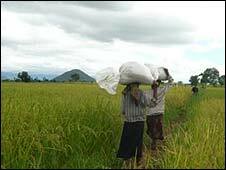 Generally, traders come directly to farmers to offer a price. Farmers are forced to accept either because lack of good roads and affordable transportation means they can only sell locally, or they do not know what the market rate is. Many sell at a low price simply because, like Mr Chacha, they need money immediately. It creates a vicious circle where farmers are unable to improve their crop yield by buying better seeds and fertiliser because they are getting such little money for their produce. This keeps the farmer in poverty - and means local consumers either rely on increasingly expensive food imports, or simply go hungry. And with the cost of food rising rapidly all over the world, solutions are urgently needed to not only feed people in the short term, but provide more in the long term. On average, small-holding farmers in Africa get only a third of the yield per hectare of farmers in other parts of the world. A project designed to help small-scale farmers in Tanzania is an example of the basic interventions that could help bring about a "green revolution". "We are helping farmers so much," says Joshua Mwankunda, acting programme co-ordinator for the Agricultural Marketing Systems Development Programme (AMSDP). "There has been a tremendous increase in yield since we started working in 2002." The project helps farmers by facilitating small loans to allow the purchase of high-yield seeds, machinery and fertiliser, and crucially has improved participating farmers' access to markets. So far AMSDP has guaranteed loans of $100,000 (£50,000) to small holders. Mr Chacha is hoping to benefit from the small loans facility next season. "I want to buy high-yield seeds," he says. "Since AMSDP built the canal next to the paddies I know farmers who get 50 bags per acre from that high-yield rice instead of my 25. That would help me and my family very much." Another important addition has been the role of "market spies" - mkulima shu shu shu in Swahili. "I go to the villages trying to find the prices of rice or other crops and I put it on the board so that the farmers can know the price it's being sold at," says Stanley Mchome, the mkulima shu shu shu for Magugu village. "We sometimes go to Arusha or Dar es Salaam to search for prices too." 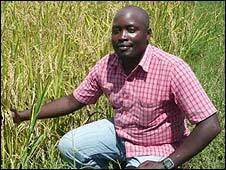 Mr Mchome sends text messages detailing the prices via his mobile phone to other farmers in the region. This gives them more power to demand fair prices from the traders. "If farmers get fair prices it gives them more capital to improve yield," explains AMSDP's Mr Mwandunda. "This could help improve the food problems of Africa." For more on the global food crisis and its impact in Africa, tune into the BBC's World Today programme. Could GM crops help feed Africa? Are you worried by rising prices?